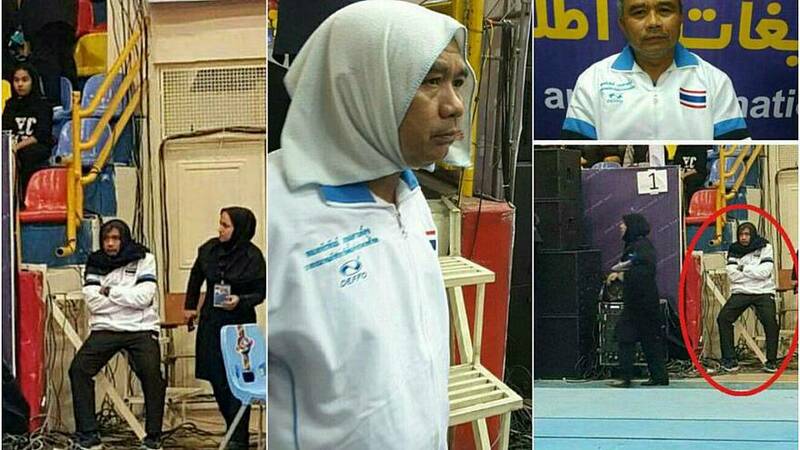 The coach of Thailand’s female kabaddi team disguised himself as a woman to watch his players compete in an international tournament in a conservative region of northern Iran. Pictures of the coach wearing the Thai team kit and makeshift headscarves in the Gorgan city stadium have circulated on social media. In some images, he is seen donning a black headscarf, while others show him with a white towel wrapped around his head as he watches the Asian championships of kabaddi - a popular contact sport that is similar to a mix of rugby, wrestling and tag. Authorities in the conservative northern region had banned men from watching female athletes compete. According to some reports, the Thai coach was ordered to leave the stadium once before managing to slip back in again. In a statement, the Iranian Federation of Kabaddi described the incident as “unjustifiable” and said the man had “violated the rules of (the) host country”. A spokesman for the federation, Abuzar Markalai, told the website Jam-e Jam, that he should "apologise for his disrespectful gesture towards women".